Mama calls it Sophie’s imagination, but Sophie calls it magic. Everything Sophie draws comes to life, and one day when Sophie feels lonely, she decides to draw a friend. But the polar bear cub isn’t very happy in Sophie’s room, where it is much too warm. So Sophie tries again. But the duck wants to swim in a pool full of water. And the giraffe is too tall for the tiny room! It isn’t long after the elephant shows up that things begin to get a little too wild and Sophie must demand that everyone go outside. 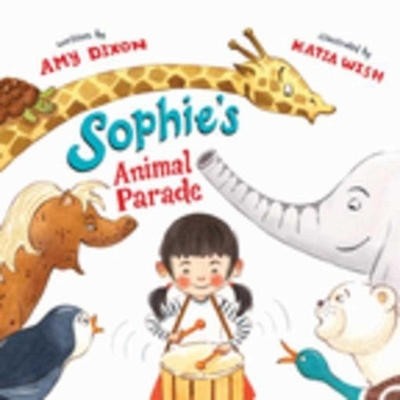 In the backyard, with all her new friends, Sophie meets someone newsomeone who happens to be an expert lion trainer. It looks like Sophie’s magic may have worked after all. Amy Dixon grew up as one of seven siblings, and the only peace and quiet she ever got was inside a book. Once she had her own kids, she rediscovered her love for picture books at the public library. It was the one place she knew all four of her kids would be happy . . . and quiet. She is the author of Marathon Mouse. She writes from her home, where she lives with her four little inspirations and her marathon-running husband in Clovis, California. Katia Wish is a children’s book illustrator. She is the winner of the 2011 Tomie dePaola Award from the Society of Children’s Book Writers and Illustrators. In addition to illustrating children’s books, Katia teaches illustration at the Massachusetts College of Art and Design, and her work has been exhibited in galleries throughout New England. She resides in Boston, Massachusetts.